Authored by YOhoho on Dec 28 2018, 12:11 AM. you don't know a edc script. Position and size can be changed dynamically using widget APIs. Could you move the definition of struct Efl.Ui.Relative_Params to efl_ui_relative.eo file? Otherwise, Relative_Params cannot be set with values by C# application. cedric added a subscriber: segfaultxavi. 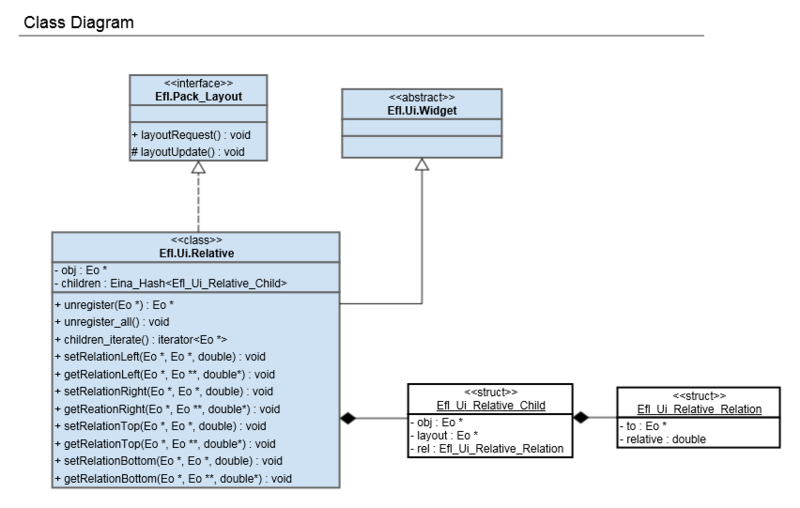 Rename Efl_Ui_Relative_Param -> Efl_Ui_Relative_Relation and integrate rel1 and rel2. (API) Rename rel1 -> left, rel2 -> right for intuitive names. Add Get method for properies. YOhoho retitled this revision from efl_ui_relative: introduce new relative container to efl_ui_relative_layout: introduce new relative container. Yes, documentation is in progress. i'll enhance it after adding more testcase and examples. rename to left, right, top, bottom. relation_left_set(Eo *obj, Eo *child, Eo *target) to set only to. relation_left_set(Eo *obj, Eo *child, double relative) to set only relative. relation_left_set(Eo *obj, Eo *child, Eo *target, double relative) to set both to and relative. However, EO doesn't support method overloading. so there are xxx_to, xxx_relative apis. Would just work for all case. Would cover all cases passing NULL. It is same to Edje. Rebase and remove relation_dir_to_set, relation_dir_relative_set apis. Remove resize object. it is unnecessary. Add testcase for chain relation. I think its now ready to land. Please check updated class diagram and testcases in my previous comment. Should we implement Efl.Pack or not to call layout,updated event? EFL_PACK_EVENT_LAYOUT_UPDATED event is provided by Efl.Pack interface. Since Efl.Ui.Relative_Layout does not implement Efl.Pack, it seems that this is not correct. 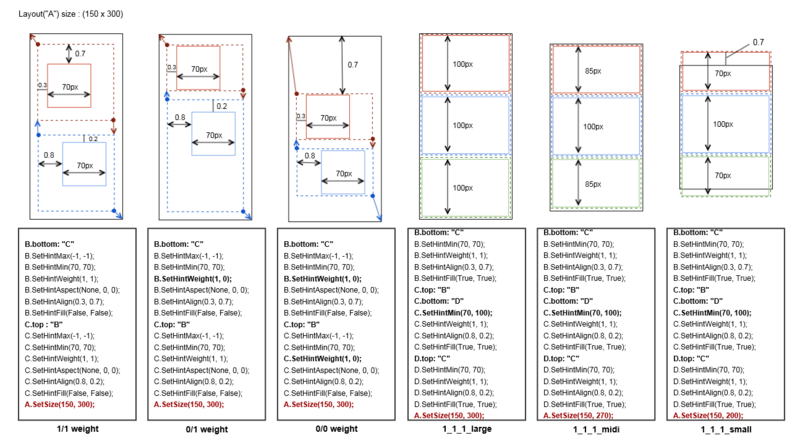 Is there any reason why relative layout itself becomes a child? It seems that child does nothing if the child is relative layout itself. What do you think to move 'layout,updated' to Efl.Pack_Layout? I think that is more suitable event for Efl.Pack_Layout which have layout_update method. A child can have a relationship with parent(relative layout). 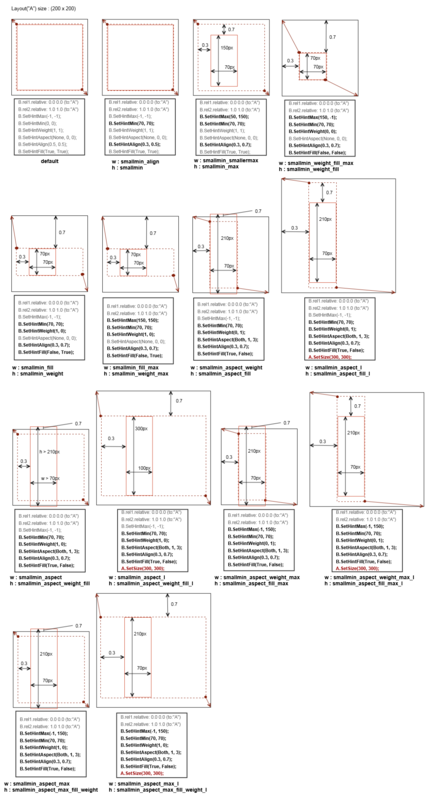 in this case, if relative layout itself becomes a child, layout calculation function can be more simple. YOhoho marked an inline comment as done.